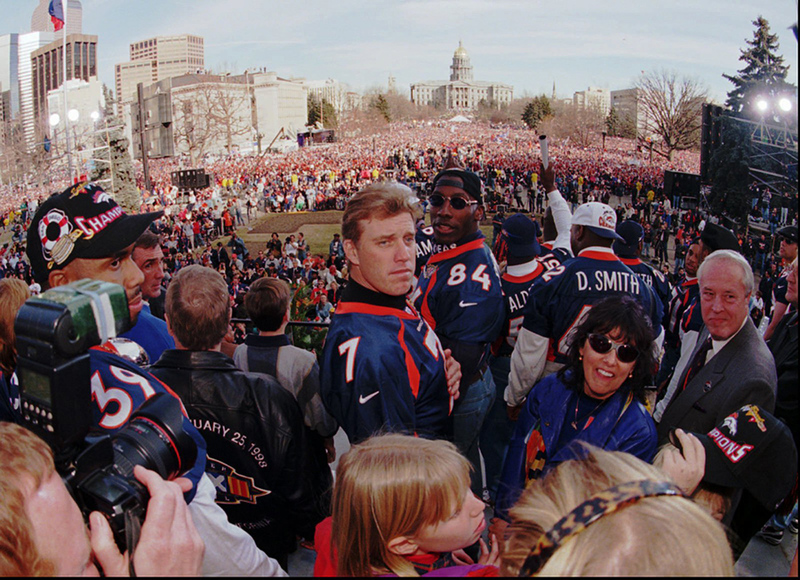 Denver Broncos quarterback John Elway (7) and tight end Shannon Sharpe (84) join their teammates on the stand at a rally to mark the team’s Super Bowl XXXII victory after a parade through the Mile High City of Denver on Tuesday, Jan. 27, 1998. An estimated 650,000 fans gathered in downtown Denver for a victory parade and rally to honor the World Champion Denver Broncos. The parade followed a route along 17th street, from Wynkoop to Broadway, and then along Broadway for several blocks before working its way to the steps of the Denver City and County Building, where a rally is held. Broncos owner Pat Bowlen, head coach Mike Shanahan, quarterback John Elway, running back Terrell Davis, Colorado Governor Roy Romer and Denver Mayor Wellington Webb address the sea of Broncos fans who pack the grounds in front of the stage. Elway and Davis are honored with street signs bearing their names.